Last week, Sprout collaborated with event designer, Elizabeth Harris, to create an inspiration vignette for a showcase held on the grounds of the Pioneer Museum. 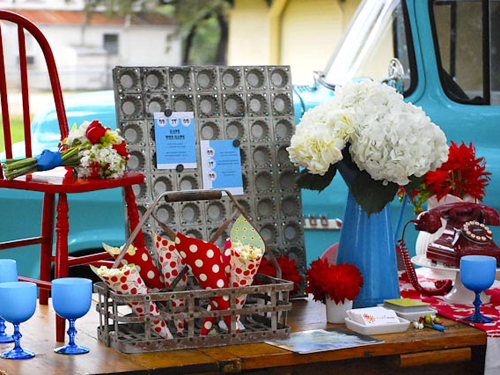 With the theme of a vintage country wedding, a rustic farm table was decked out with vintage finds and flowers in turquoise and red. Flowers included bright red dahlias, white hydrangeas and a bridal bouquet of white stock, red tulips and viburnum berries, green mini cymbidiums and china berries.